Bear with me while I paint a grim picture. Imagine that you’re in desperate need of help. You start to shout out but the only word that comes out of your mouth is ‘play’. No one can understand what you’re saying. Feeling frustrated yet? Helpless, even? Well, that is exactly how a person with aphasia feels. Aphasia is a medical condition that affects a person’s communication skill — either their speech or writing. “How does it feel when you can’t communicate? How do you make friends? How do you talk? 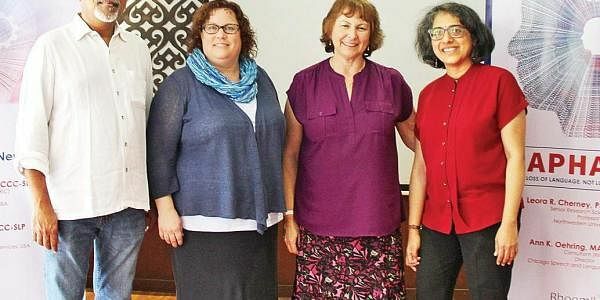 You’re still intelligent, but no one knows that,” asks Leora Cherney, senior research scientist, Rehabilitation Institute of Chicago, at a talk on aphasia organised by Bhoomika Trust in association with Sri Ramachandra University. “You might want to say ‘chair’, but the word that comes out could be ‘layer’, ‘table’, or just about anything,” she adds. A decade ago, there were 3,915,700 cases of aphasia reported in India, with stroke being the leading cause. Ready to hear something else that’s equally shocking? There are just 2,500 registered speech pathologists to treat adult aphasia patients. Even though we’re developed in other sciences, we haven’t really progressed enough to treat this communication impairment. But thanks to a couple of specialists from the US, aphasia patients are now getting the help they need to speak again. By using different techniques of communication and art therapy, these specialists are able to help the patients. This includes creating communication ramps and cortical stimulation. Ann Oehring, a consultant at the RIC urges the caregivers to ask more close-ended questions to the patients. “Never yell at them. Yelling only makes it worse. Also, never pretend to understand something unless you genuinely do,” she advises. The condition has no age bar. It can affect anyone. “We’ve seen aphasia affect 18-year-olds, 19-year-olds, and 22-year-olds. It affects everyone the same way. What is important is to think of what can be done to help them,” says Cherney. She remembers a patient of hers who had aphasia following a stroke when he was in University. “We were able to train him, send him back to school and get him to finish his degree. But it wasn’t very easy. He needed someone with him all the time to take and review notes. Aphasia has nothing to do with intelligence, but for students who have to deal with language studies every day, it can be very challenging,” she explains. When asked about the stigma associated with aphasia, Jayendra Panchapakesan, co-founder of Bhoomika Trust says, “I don’t think there is much stigma associated with aphasia since people don’t even know about it,” he laughs. “But what is the point of treating these people differently? Would you treat a diabetic person differently?” His wife, Sudha has been suffering from aphasia for the past two years.